'Calder after the war' at Pace London featured nearly fifty works of art created by Alexander Calder between the years 1945-1949. The artist’s famous mobiles, stabiles and standing mobiles were installed on the gallery’s ground floor, whilst the newly renovated first floor hosts a display of Calder’s rarely-seen paintings and gouaches. Calder’s characteristic approach to abstraction was prompted by a visit to Piet Mondrian’s studio in 1930. The famous Calder ‘mobile’, as termed by Marcel Duchamp, was first developed in 1931, merging European Abstraction, Surrealism and Dadaism with a fascination with mechanical invention and the forces of nature. 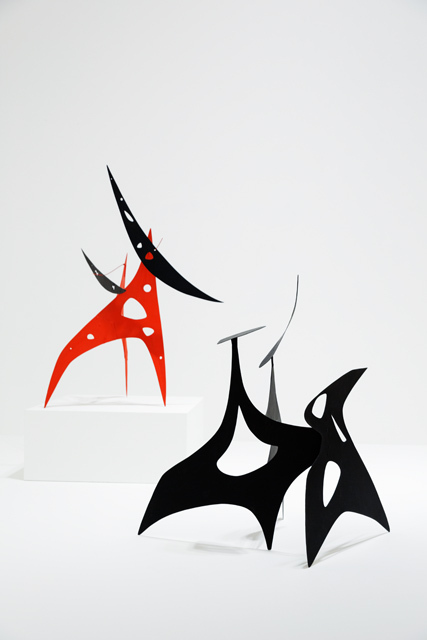 the return of supplies of aluminium sheet metal at the end of WW2 unleashed a new force of innovation in Calder’s practice, with works attaining a lyrical complexity of geometrical form.